WHY GO: The Great Northern Catskills of Greene County, the lesser traveled portion of the Catskill Mountains, is being re-energized as New York’s extreme adventure park – a mere two hours from Manhattan. But, in reality, this has been America’s Adventureland for over 200 years. In the mid-1800’s, travelers would take steamboats to Catskill NY, where coaches awaited to whisk city folk up to the mountains. In 1890’s, the Otis Railway replaced the arduous horse and carriages, and by the 1940’s, cars put the railroad out of business. There’s music (Mountain Jam and Taste of Country on Hunter Mountain draw celebrity bands and huge crowds), art and even zombies within the spectacular landscape that launched a whole school of art. 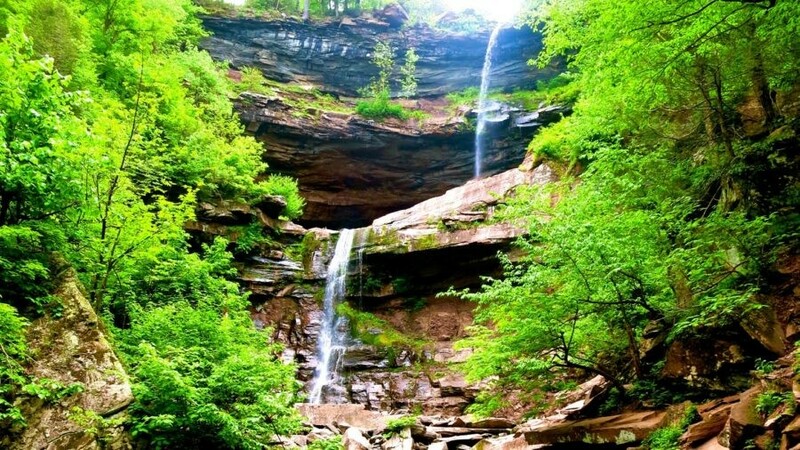 Incorporating the mountain towns of Tannersville, Haines Falls, Hunter, Prattsville and Windham, and the notch in the mountains known as Kaaterskill Clove, you’ll find many days of pleasure in these hills. CUSTOM HIKE: Catskill Mountain Wild. Professional guide, Jeff Vincent, is wild about hiking – and will plan a hiking itinerary tailored to your competency and needs. From gentle walks to the most strenuous trails, and even camping, fishing and canoe-trips, he’ll take you alone or groups of up to 20 (with another guide). Future plans include connecting with “Campside Chef” – another local hiking guru who whips up a gourmet meal for lunch or at days end. Vincent charges by the hike (not per hour), starting at $100 for easy hikes (up to 4 people, 2-3 hours), and $65 pp for longer, difficult “bushwhacking” hikes. 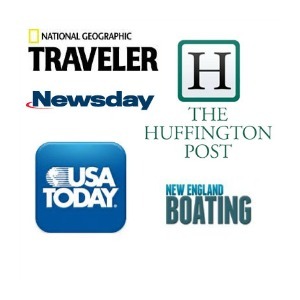 Consult website for other services. 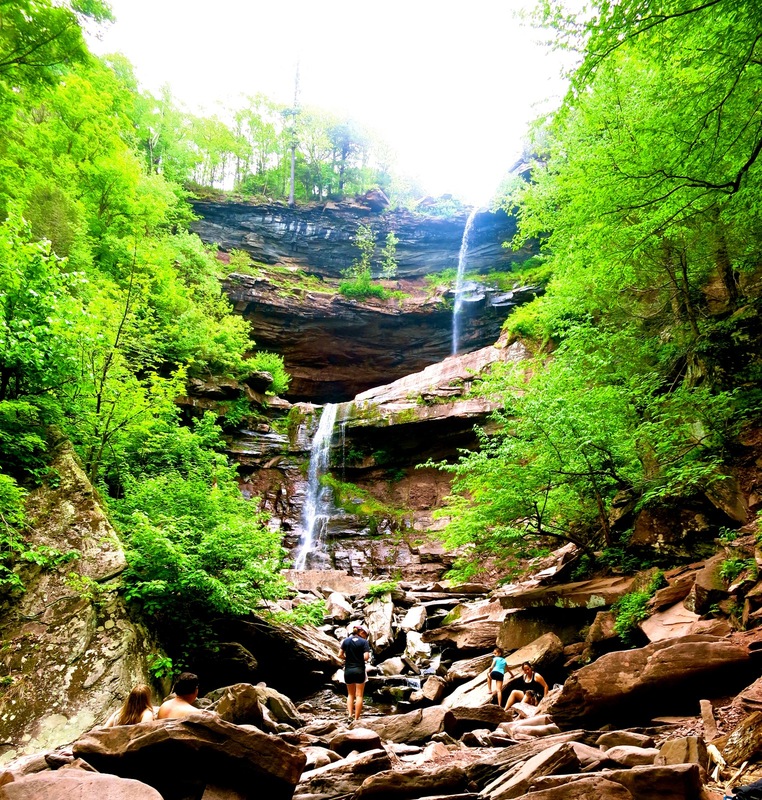 HIKE: Kaaterskill Falls. 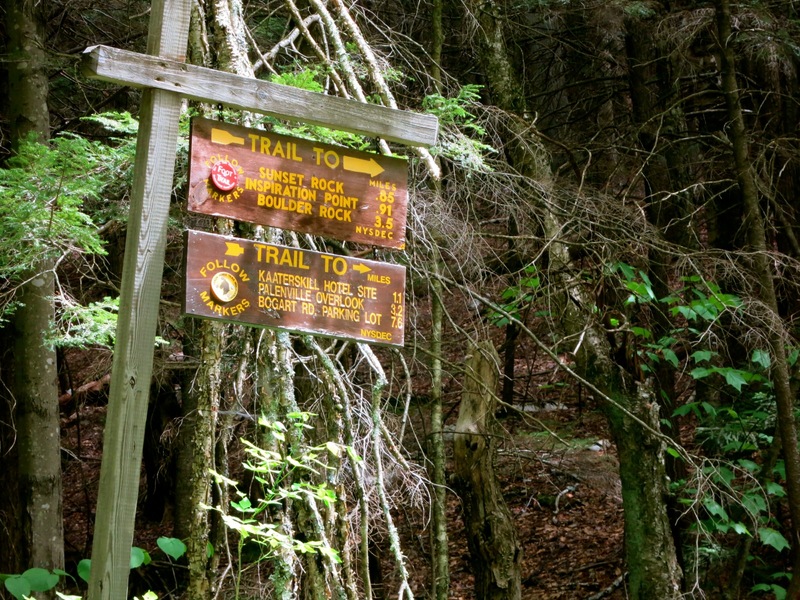 “The most treacherous part of this hike is the walk from the parking lot to the trailhead,” warn those who do this moderate trek often. On a hairpin curve on busy Rt. 23a, you’ll see a couple of waterfalls right on the road. These are not the 260 ft. double-drop cascades made famous in Washington Irving’s 1812 story, Rip Van Winkle and Thomas Cole’s romantically rendered landscape paintings. For those, you’ll have to hike another half mile each way, on a very rocky and rooty path, to see that. There have been some tragic deaths here over the years, mostly due to people going off-trail, hiking from the bottom of the falls to the top (not allowed) or getting too close to the precipice of the falls up top. Visitors are urged to wear closed-toe hiking shoes, stay on marked trails, and stay off of rocks near the falls. The falls are truly worth seeing, but the path is not a “walk in the park.” Round trip hike from parking lot on Rt 23 (just up the hill from the trailhead) is 1.4 miles. Allow at least an hour. HIKE: North South Lake Trail (home of the Fried Chicken War). In the late 1800’s, this area of the country was so popular, there were dozens of hotels (since burned down) and thousands of rooms in total. Hike the 10.3 mile loop around North South Lake, and you’ll see signs for the remains of the Catskill Mountain House and Kaaterskill Hotel – at 1,200 rooms, once the largest mountain hotel in the country. Local lore has it that Philadelphia businessman, George Harding, stepped into the 400-room Catskill Mountain House and demanded fried chicken for his daughter, who could not eat red meat. As The Catskill Mountain House was serving only Roast Beef that evening, the owner bellowed – “If you want fried chicken, you’ll have to build your own hotel.” Harding took the challenge – opening the bigger and better Kaaterskill Hotel right at the top of Kaaterskill Falls less than a mile away. The feud, known as “The Fried Chicken War,” was forever stamped in Catskills history. If you just plan to hike, park in the lot before you get to the manned gate to avoid fees. HIKE/PRATTSVILLE: Pratt Rock. Put your sturdy boots on for the 500-foot climb up the crumbly steps of what has been termed a “monument to vanity.” Zadock Pratt, tannery tycoon and Congressman, born in 1790, hired an out-of-work stonemason to sculpt his life story in the soaring cliffs near his house. The result is as offbeat an attraction as they come, with views of the surrounding area worth the ascent. 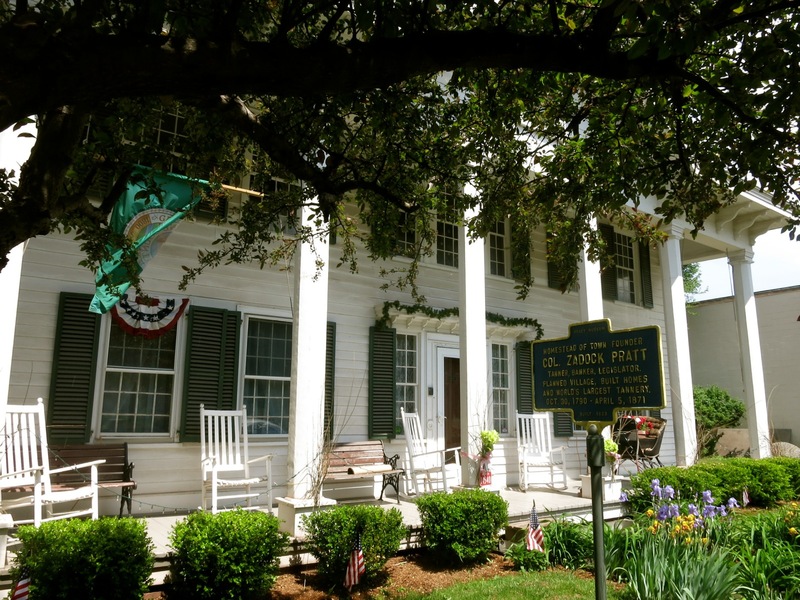 Afterwards, drive a few miles into Prattsville to the Pratt Museum in Zadock’s home for more information about the man. Museum open Fri-Mon 10-5. $10. SKI/ZIPLINE: Hunter Mountain. Spurring a four-season renaissance in this area, Hunter Mountain now lures Zip Line lovers in the warmer months with the “Longest and highest Zipline Tour in North America:” six hundred feet above the forest floor, you’ll go 50 mph. There are several “themed” zipline tours, including the Zombie-Hunter Wars, an interactive, theatrical experience with paintball guns. Not into zipping? You can also take the Skyride up to the mountaintop for enchanting Catskill views. 3-hour plus tours start at $90 per person. SKI/MOUNTAIN BIKE: Windham Mountain. Ski in the winter, bomb down the mountain on two wheels come summer. Windham is building up its reputation as a mountain-biking mecca. 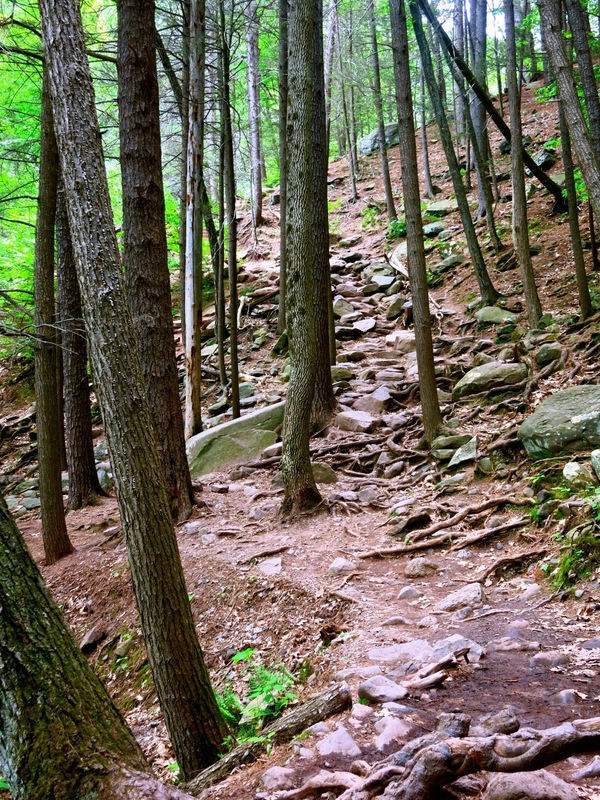 The newly developed Huckleberry Trail, that begins in Tannersville, has been expanded from an easy 2.2 miles into more difficult portions of the mountainside. DRIVE: Private Communities of Elka Park, Onteora, and Twilight Park. Mark Twain purchased a summer home in the tony Onteora neighborhood, and you can see the mansions that remain here and in the other elite neighborhoods high in these hills. STROLL: Tannersville Main St (Rt 23a). 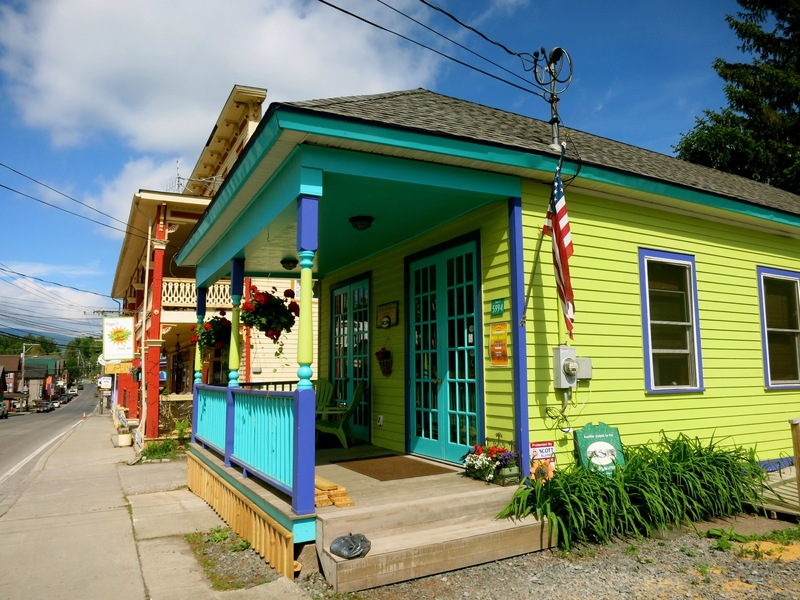 If you love vibrantly colored buildings, you will adore Tannersville, which seems to have been dipped in rainbows. It’s also the kind of place where the mayor of 20 years helps run his wife’s family’s Italian resort, where a bustling library and Learning Center is housed in a former Church, where the Catskill Jazz Factory hosts musicians from Lincoln Center, and where a new Pharmacy offers advice on holistic treatments along with traditional meds. In the 1800’s, the town was known worldwide for its tanneries, due to an abundance of tannin-rich Hemlock trees (hence the name). As industry declined, this area did, too. 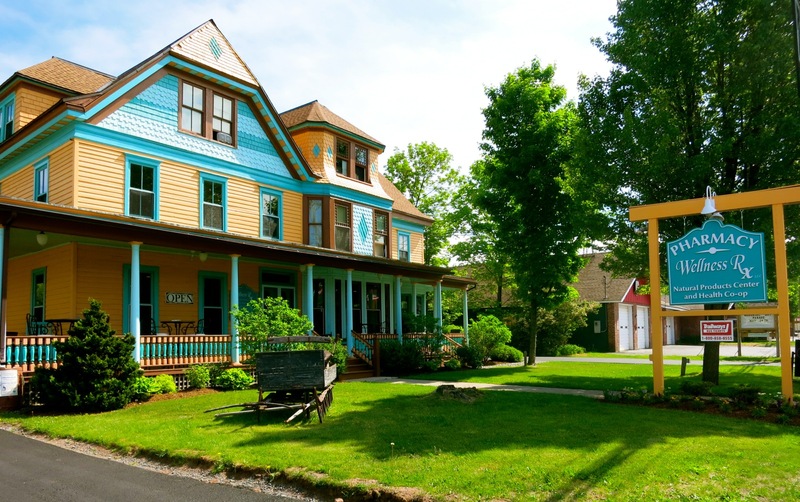 Now, with infusion of cash from Royce Funds founder, “Chuck” Royce (who also re-built the Ocean House in Watch Hill RI and owns the luxurious Deer Mountain Inn here), and profusion of color by artist Elena Patterson, main street is playful and attracting tourists once again. 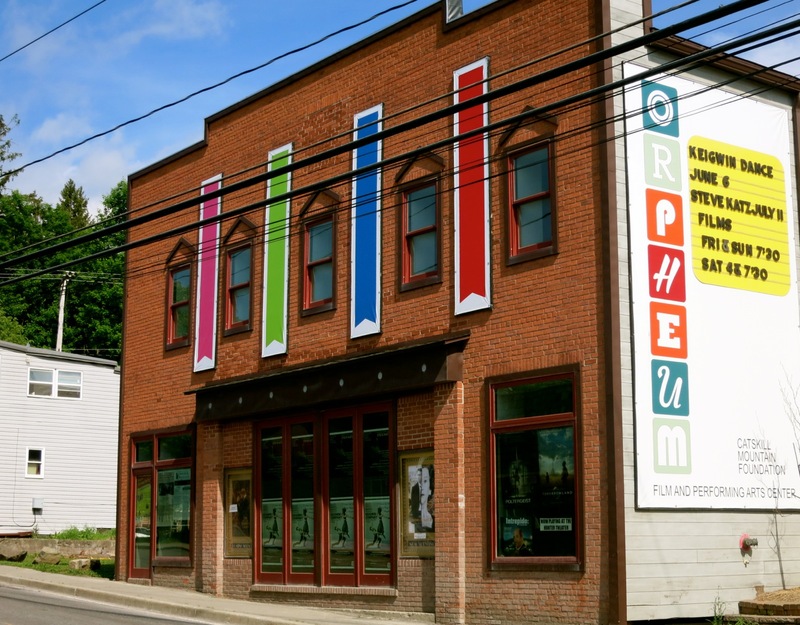 If here in the evening, see a show at the Orpheum Theater. Reopened after a top to bottom renovation, this theater features both live performances and first-run movies. 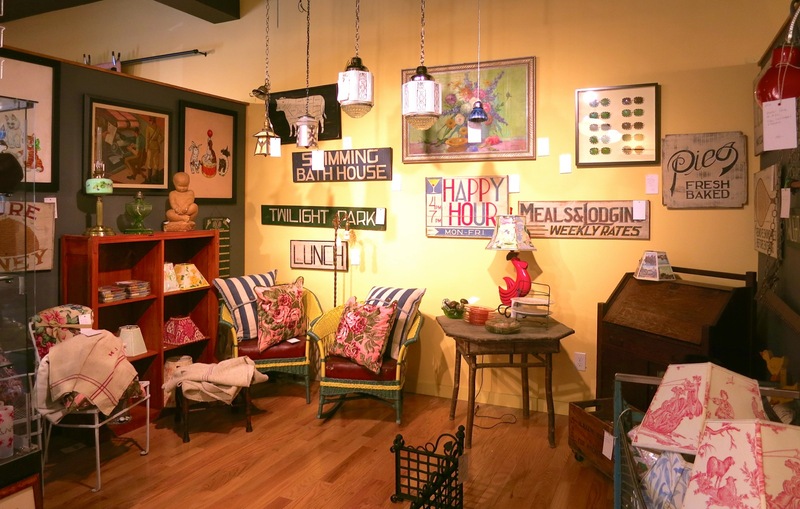 Score some antiques in the Antique Annex (wooden x-country skis $90) Stop into the Say What Contemporary Art Gallery, Catskill Mountain Country Store, Last Chance Cheese Antiques and Café, and the brand new, wonderful Pharmacy, Wellness R/X. See below. SHOP/TANNERSVILLE: Wellness R/X. Even if you don’t need pills or medical attention, this apothecary is a great place to stop for a cool drink or healthy snack. Integrative and informative, the not-quite-traditional Wellness R/X combines regular meds with natural products for a holistic approach to health care. Along with long-approved prescriptions, this facility provides immunizations, has clinical rooms for private consultations, is a pharmacist-training center and focuses on Lyme disease. “Most illnesses can fit into one or more of four categories: pain, diabetes, cardiac problems and mental illness,” says owner/pharmacist Ed Ulman. Wellness R/X addresses it all, while working in conjunction with already established area Yoga and Massage centers. SPA/WINDHAM. Alpine Spa at Windham Mountain. While your more adventurous friends or the rest of your brood are skiing, zip-lining, or mountain biking (depending on the season), book a decadent treatment at this brand new, tranquil spa near the ski lodge. Staff is professional, and massages, scrubs, wraps and facials are heavenly. One hour massages and facials start at $100. RSVP necessary as treatments sell out far in advance. VISIT/SOUTH CAIRO: Mahayana Buddhist Temple. 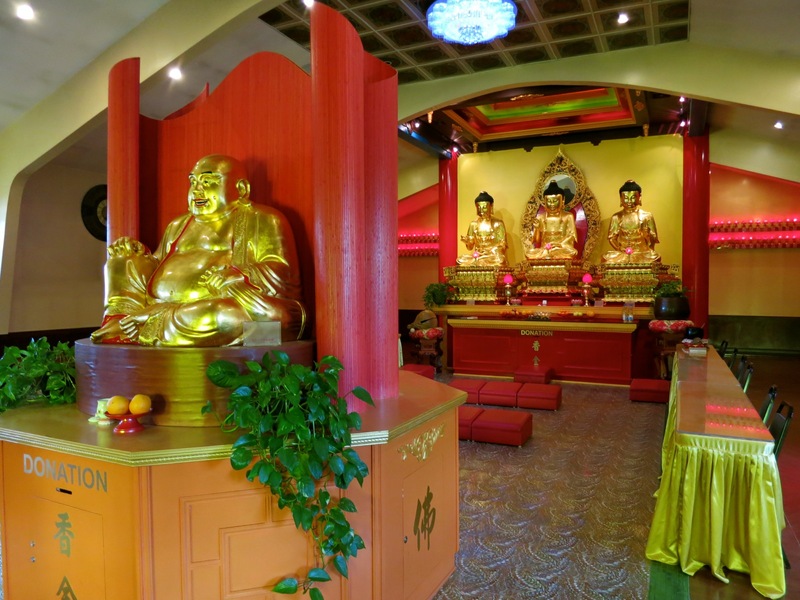 There’s nothing like wandering the grounds of a Buddhist Temple to sooth your nerves, especially when the Temple is actually a series of buildings on landscaped grounds containing a cornucopia of golden Buddha’s. At a few points, Chinese music emanating from speakers hidden in the foliage seems to be pouring directly into your ears, as if you were wearing ear-buds – a freaky sensation. Open year round, free, but donations gladly accepted. 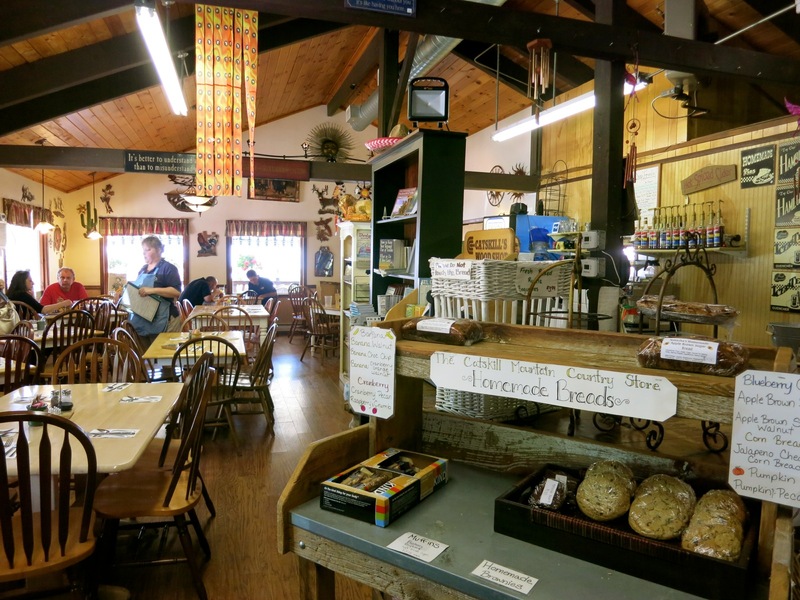 EAT: Catskill Mountain Country Store, Windham. The food inside this general store is good and fresh from “Boring Salad” to “Smokin’ Fish Sandwich” ($5.99) with locally smoked trout. EAT: Bistro Brie & Bordeaux, Windham. Nosh on risotto, steak frites and bouillabaisse in popular Bistro Brie & Bordeaux where les enfants have their very own menu. The inviting sunflower-yellow interior and unpretentious staff make dining on sophisticated fare all the more pleasing. EAT: Local favorites – Chicken Run, Windham for handcut steaks, great fried chicken and concerts in the back, Last Chance Cheese in Tannersville for beer, candy counter and lots of cheese, Pancho Villas in Tannersville for good Mexican food, and Mama’s Boy/Smiley’s in Tannersville for grass-fed beef burgers and old fashioned shakes. 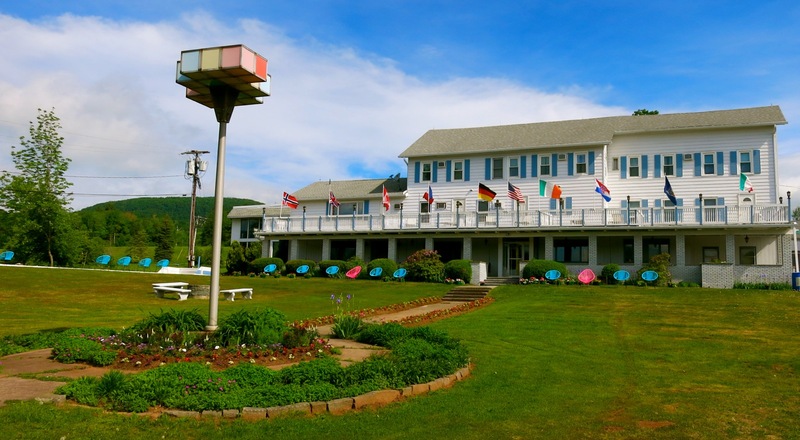 STAY: Rosehaven Inn, Haines Falls. 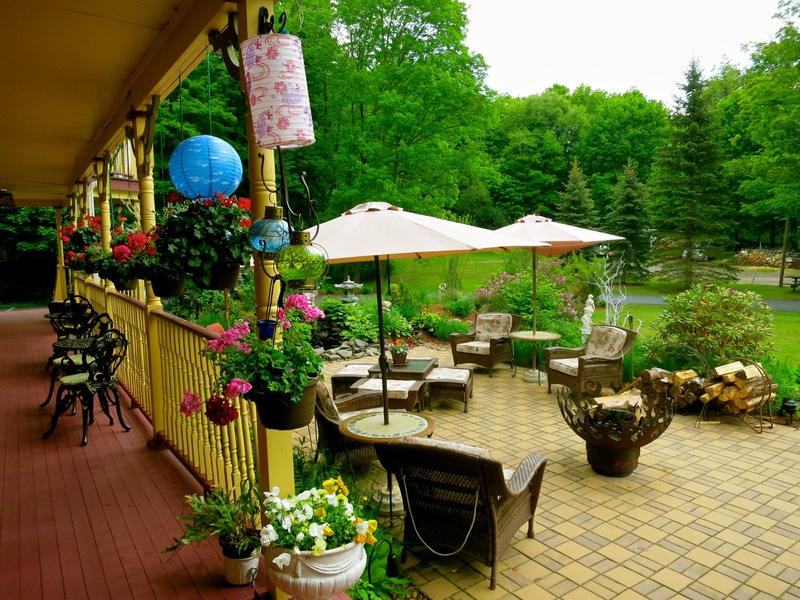 Situated at the head of the magnificent Kaaterskill Clove, high in the hills above Route 23, this restorative, four room Arts and Crafts B&B is literally a breath of fresh air. Owned by the ebullient Kelly Coughlin (who also renovated and owned the Fairlawn Inn in Hunter before selling it in 2002), Rosehaven is a true haven. Guestrooms are beautiful and immaculate, with high-end bedding you don’t want to leave. In the common areas, whatever is not polished wood – floors, wainscoting, some overhead surfaces – is covered with fancy wallpaper. 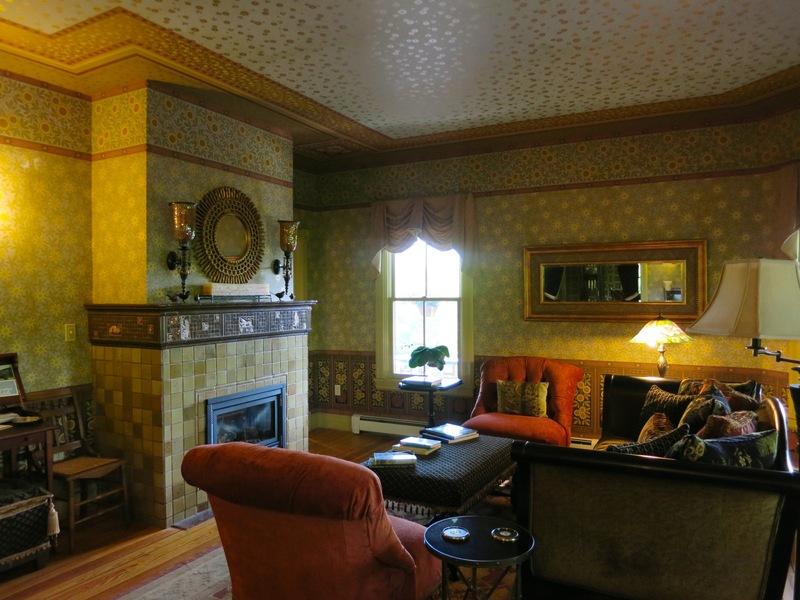 In fact, the wallpaper not only lines walls, but adorns ceilings as well (a signature Coughlin embellishment). 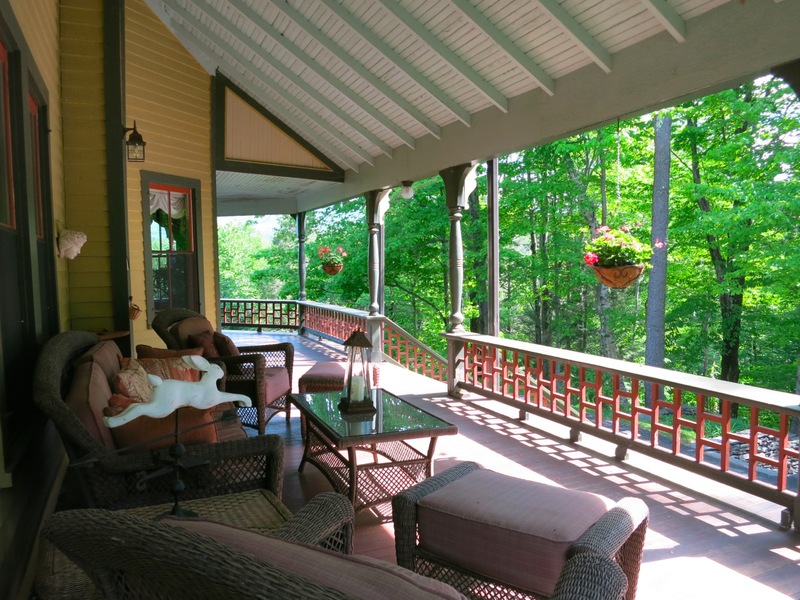 Take breakfast in a stately dining room or on the home’s inviting wraparound porch with fantastic Catskill Mountain views. The fare, especially Kelly’s Cheesecake Scones, vies with the vista for excellence. Rooms, $130-$225 depending on size and day of the week, include parking, snacks, a multicourse gourmet breakfast and one of the warmest receptions you’ll ever receive at an inn. 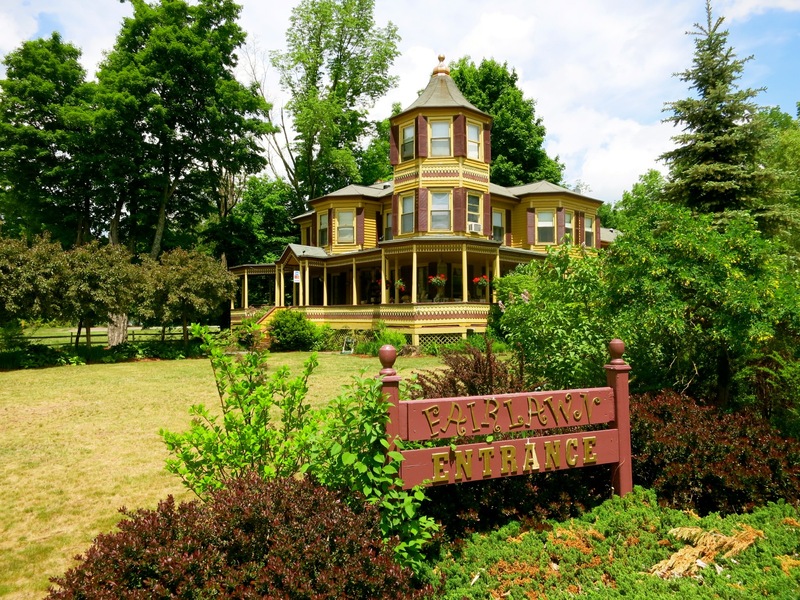 STAY/HUNTER: Fairlawn Inn, Hunter. Just past the entrance to Hunter Mountain on Route 23, this beautiful nine room B&B was once the 1904 summer home of prominent Jewish philanthropist, Harry Fischel (who helped establish a kosher kitchen on Ellis Island was benefactor of many Jewish institutions including Yeshiva University). 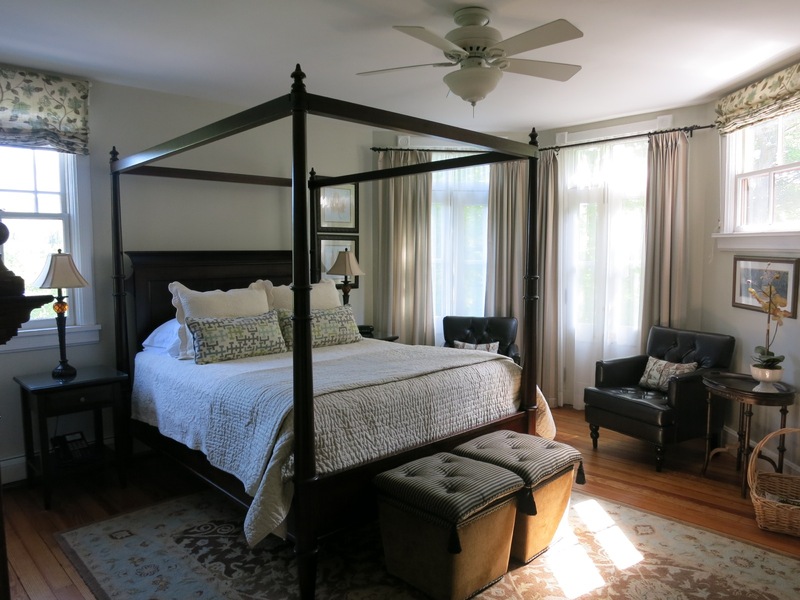 Updated with an inviting patio, fantastic architectural features, and a wild, don’t-know-where-to-look-next fantasia of Victoriana (including Tiffany Lamp reproductions), the Fairlawn is a terrific “offbeat” yet upscale place to bed down. Owner Chuck Tomajko recently repainted the exterior in Autumn Gold and New London Burgundy – a color combination that pops from the roadway (you can’t miss it). 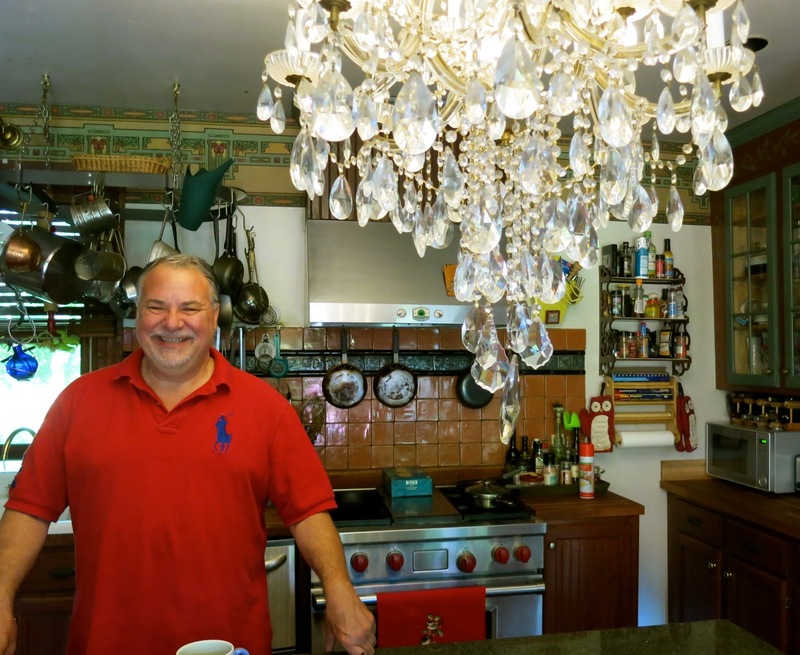 He does his own catering in a kitchen bejeweled by a crystal chandelier, and his breakfasts are divine. Rooms include free wi-fi, snacks, soft drinks, parking and gourmet breakfast, from $129 midweek smaller room to $249 weekend largest rooms. STAY/TANNERSVILLE: Villa Vosilla, Tannersville. This area of the Catskills was once known as the “Italian Alps” – and VV is one of the “Last authentic Italian resort of its kind in the USA.” The sign says it’s a “boutique” resort (marked by a few lamps from the 1964 New York World’s Fair), but this all-inclusive resort is down to earth Italian family hospitality all the way. Villa Vosilla opened in 1964 in what was the kosher Rose Garden Hotel, and is now run by its fourth generation. Like the Jewish resorts that once dotted the southern Catskills (think, “Dirty Dancing”), this place has a restaurant and nightclub that features musicians and acts geared toward multi-generation Italian-American travelers (and those who just love the Italian culture). There are tennis courts, pools (one indoor, one outdoor), picnic areas, indoor and outdoor bocce courts, and indoor shuffleboard and bocce in a humungous recreation room. There’s even a nine-hole golf course right across the street that costs just $25. And that includes the cart! $350 per person two nights on weekends, $800 per person weekly. Includes all meals and activities. STAY/HUNTER: Kaatskill Mountain Club, Hunter. For those who want a full-service, larger hotel experience, the Kaatskill Mountain Club, built in 2005, offers 115 mission-style designed rooms with in-house restaurant .